Given Samsung’s strong brand and the PN64D8000’s excellent performance and slim design, we think it is entirely possible that the Samsung PN64D8000 could redefine the public’s perception of plasma TV technology. Samsung D8000 series information: Our review of the 64-inch Samsung PN64D8000 is based on our hands-on look at the 51-inch PN51D8000 television. The observations made apply to the 59-inch PN59D8000. Samsung says that the three TVs have identical specifications (except for dimensions and weight) and performance should be similar. The short answers to those two questions are, in order, “No” and “Not exactly,” and Samsung’s D8000 series is evidence. But some clarification is in order for those not familiar with the current state of plasma TV technology. LCD TV technology allowed TVs to become lighter, thinner and wall-mount friendly. That being the case, they surged in popularity and, for a time, left plasma coughing in their dust. Then LED back-lighting came along and made TVs even lighter and ridiculously thin. A wall-mounted Sony Bravia XBR HX929 or Samsung D8000 LED TV are both great examples of how slick an uber-thin TV can look when wall-mounted. It’s like…TV art, baby. Pair that with the fact that you can find a low-end 50-inch plasma at big department stores on sale for less than $600 and it is easy to understand why the public at large thinks plasma is a technology quickly going the way of the Betamax video tape. Well, we’re here to help try to put an end to that myth. The fact is plasma TV technology has come a long, long way, and when it comes right down to it, still offers the best-looking picture out there. 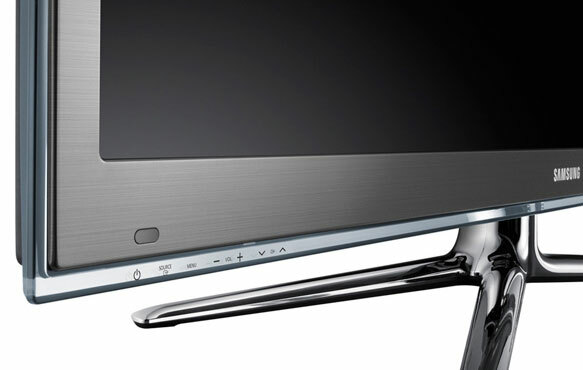 Samsung’s PN64D8000 TV is a paradigm for the state of the art in plasma TV. It’s light, super thin and, as we’ll soon discuss, looks fantastic. In our Samsung PN64D8000 review, we discuss what it is this TV has to offer, its benefits over the LED camp and under what circumstances you should fast-track this TV to the top of your short-list. We couldn’t help but chuckle a little bit as we pulled the PN64D8000 out of its box. It’s amazing how thin and relatively light plasma TVs have gotten and how quickly they’ve transformed. Just a couple of years ago, reviewers were describing 95-pound TVs as “svelte.” The PN64D8000 isn’t a featherweight by any means, but at just over 51 lbs (without stand) it’s a far cry from the heft we’ve previously associated with plasmas. As we mentioned, thin is in, and the PN64D8000 is definitely one of the cool kids on the block in that regard. The TV measures 47.1 x 28.3 x 1.5 inches (WxHxD). To put that in perspective, Samsung’s D8000 LED-backlit TV is just .3 inches shallower at 1.2 inches deep. In the box with the TV we found a stand, a component/AV breakout cable, what we contend is one of the finest TV remotes available today, and two pair of Samsung’s 3D glasses. Samsung’s remote control for the D8000 series is one of our favorite stock remotes ever. The Bluetooth QWERTY keyboard is extremely handy when it comes to entering user names and passwords and is essential for entering URLs when surfing the Web using the set’s SmartHUB web browser. Speaking of Samsung’s SmartHUB Internet section, it’s got more pre-loaded apps than you’re likely to use. Hulu Plus and Netflix will probably get the most play time (and we think the apps for both are among the best we’ve ever used) but if you want access to special network content from MTV or ESPN, or high-definition movies from VUDU, that’s available, too. The trick here is knowing to go download the app if it isn’t already pre-loaded. Fortunately, downloads are quick and painless. Yahoo Widgets is found in a separate section for some reason. We think if TV makers are going to insist on including widgets, they ought to integrate them more seamlessly.The only other negative remarks we have for SmartHUB: There’s no Amazon Instant Video, a service which has poised itself as a major player in the world of on-demand video, and the TV’s search feature doesn’t run as deep as we’d like it to, consideringthe TV has the entire Internet to search for content. This set’s bezel is one of the most attractive we’ve seen on a TV. Not only is it thin (thus allowing more viewable screen area) but has a good-looking, dark taupe(ish) brushed metal appearance with a clear, plexi-glass trim. This artfully designed TV (also available in silver) will most certainly be a welcome addition to any wall in a home. For the time being, this set comes with two pair of Samsung’s entry-level 3D glasses ($30 each retail) along with a copy of the movie Megamind in 3D. That promotion may change as the holiday season approaches, but we’re pretty sure the free glasses will stick. For slicker looking 3D eyewear, Samsung also offers the SSG-3500CR ($80) and the SSG-3700CR ($130) as alternatives. These premium sets offer some convenience features such as USB rechargeable batteries and auto-on when 3D content is sensed. The PN64D8000 has some of the best “out of the box” performance we’ve ever seen. We did go through with our customary calibration procedure, but not until we had already spent a good amount of time staring wide-eyed at the TV’s outstanding picture. The color accuracy with this set is so naturally excellent that it wouldn’t surprise us to learn that most users never bother tweaking any picture settings. This TV has outstanding black levels and superb contrast. Frankly, we expected that since plasma TV’s usually do well in that regard. What really grabbed our attention here was the set’s deep, rich and accurate color. Having spent the lion’s share of our TV review time over the last year on LCD TVs — be they of the CCFL or LED backlit variety –we’ve had to fight off the desensitization effect that their sometimes excruciatingly vivid color output can have on the eye. We liken the situation to listening to a particularly bright amplifier or set of speakers for a long time. Eventually, the mind’s ear can get used to that sort of sound and even the most balanced speakers can sound subdued by comparison. In our own TV buyers guide, we suggest that the LCD TV’s greatest advantage over plasma is its brightness, thus making it a superior option for rooms that see a lot of daylight. However, just as the PN64D8000 closes the thinness gap between plasma and LCD, so it does with brightness potential as well. We have no doubt that this TV can hang in a room exposed to plenty of daylight and still provide viewers with an engaging image. This TV even made streaming video look good. We watched a few HD video clips from both Netflix and Hulu, and while Netflix’s frequently poor bitrates were evidenced by the occasional presence of “screen door effect,” picture quality was generally very good. Some of the high-definition streams of TV shows such as House and Glee looked just as good as their broadcast counterparts. When it comes to 3D performance, the PN64D8000, once again, earns very high praise. Because we experienced almost no crosstalk, we were treated to a 3D image that had impressive depth. We still aren’t getting that “object is hurling toward your face” effect and there were times when the whole 3D thing just seemed a little unnecessary, but so far this is our favorite plasma set for viewing 3D content. If you look hard enough, you can find fault with just about any TV’s performance. In the case of the PN64D8000, we had to look harder than usual. If looking for it, some motion jitter can be seen, but show us a TV where that isn’t the case. We also noticed this TV had a tough time with some of the de-interlacing patterns we ran through it. Finally, since there’s so much crammed into this TV in the way of features and functionality, navigating through it might become overwhelming for some. Given Samsung’s strong brand and the PN64D8000’s excellent performance and slim design, we think it is entirely possible that this TV could redefine the public’s perception of plasma TV technology. If that happens, the divergence in price between plasma and LCD could close significantly. Right now, we’re seeing a street price for this TV at around $1,800. Samsung’s LED-backlit equivalent, the UN55D8000, currently goes for about $2,500 from the same retailers. Granted, the latter is 4 inches larger, but with this plasma from Samsung, you get much better performance in a perfectly pretty and amply sized package. While we’ll be holding off on granting this set our Editor’s Choice award until we’ve had a chance to compare it to its chief competition (the Panasonic VT20), it is certainly in the running. For now, this TV comes with our highest recommendation.